What better way to celebrate Kitchen & Bath Month than with new products? 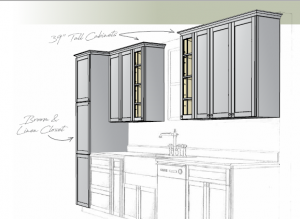 Our Product Development team has been hard at work, adding to the designability of the Marsh Cabinets product line. Today, we’re introducing some of our favorite items from this month’s release—read about these products, and the possibilities they bring to kitchen and bath design, below! Marsh 39” cabinets are making their debut as a significant and remodel-friendly addition to the Marsh Cabinets product line. As one of the top requests among Marsh designers, the 39” collection is an addition we’re particularly looking forward to. These cabinets have the potential to bring maximized storage and a more streamlined look to homes with a ceiling height of eight feet by eliminating unused space and the need for additional crown molding. We believe our designers will find remarkable value in this product when designing for a homeowner, and we’re excited to see the projects this collection facilitates! Complementing our 39” cabinets is our broom & linen closet. This functional cabinet is the storage solution every modern kitchen needs, and its versatility can’t be overstated. With this cabinet, we’re offering a number of shelving options that further enhance the storage opportunities available. Shelf kits can transform the broom & linen closet into a pantry-like space, while half shelves ensure an added level of customization that tailors storage to each homeowner’s needs. Storage is even easier with our latest accessories! Additions like our new hamper cabinet, tray dividers, and pegboards make organizing the home a breeze. Our industry has seen organizational accessories such as these trending more and more lately, and with good reason. Homeowners are searching for products that go above and beyond to simplify daily tasks and routines. By organizing plates, bowls, and cups for the user, Marsh Cabinets pegboards eliminate a chore and maximize drawer space. See them in action below. This launch also brings our Marsh Cabinets Open Wall Cabinets, which take cabinetry from functional storage to beautiful displays. Open shelving is a popular option for adding interest to contemporary kitchens, and we’re excited to introduce these products—with their sturdy, ¾-inch shelves—to the mix. Perfect for storing homeowners’ favorite knick-knacks, formal dinnerware, and even small appliances, our open wall cabinets can be used for a decorative twist on cabinetry. These cabinets lack pilot holes in both the frames and bored backs, resulting in a clean SKU design. Further, we offer these in a number of configurations and in the signature Marsh finish of your choice to fit every customer’s needs. Don’t forget about our floating shelves! Introduced in the summer of 2016, Marsh floating shelves are themselves part of a kitchen’s décor. Floating shelves with glass jars containing a homeowner’s favorite cooking ingredients, for example, not only simplifies cooking for them but also creates a striking contrast among traditional cabinets. For kitchens with storage to spare, adding a picture frame—as shown below—is never a bad idea! Make your floating shelf display more prominent with under cabinet lighting! To see all of the latest Marsh Cabinets products, be sure to check out our October 2017 launch brochure here. The post New Products Are Here! appeared first on Marsh Furniture.